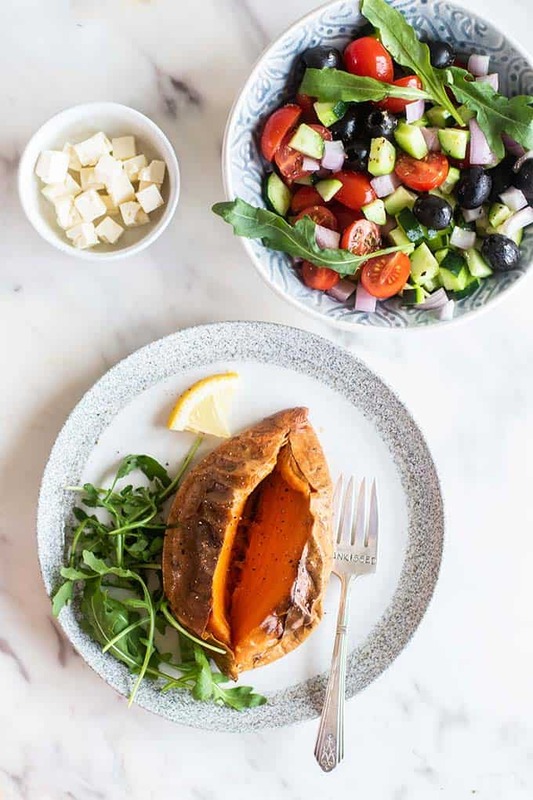 Stuffed Sweet Potatoes make a great meal any time of the day! 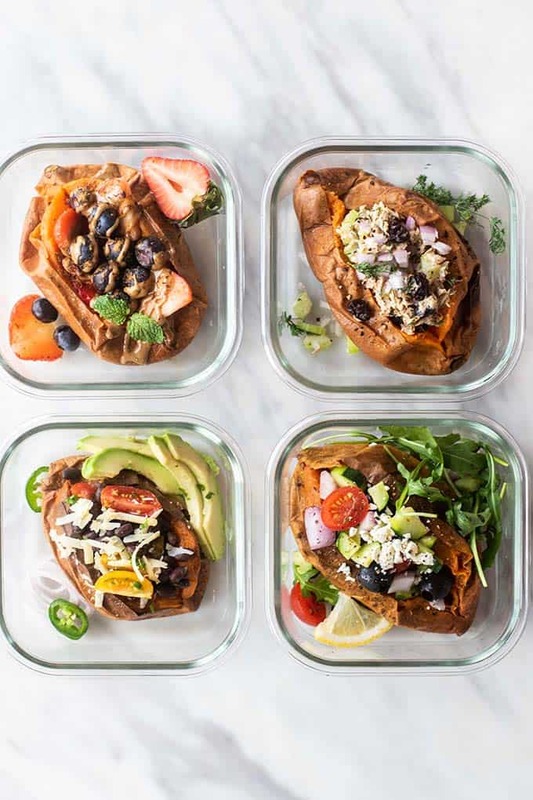 Use these ideas as inspiration to meal prep sweet potatoes for a healthier week. Try a Greek Salad, Cherry Tuna Salad, Black Bean Burrito, or a breakfast Berry & Almond Butter stuffed potato. 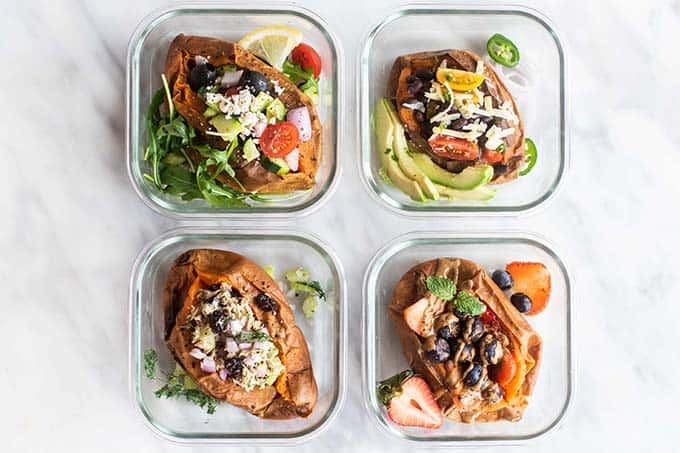 Meet my new favorite meal prep: baked sweet potatoes, with a variety of fillings. Since I began actively meal prepping again, baked sweet potatoes are a regular addition to the menu. They take about 5 minutes to get ready, and then they slowly bake while I am doing other things in the kitchen — making other dishes, doing the dishes, chasing my toddler who’s breaking my dishes . . . (you get the point). Easy is necessary in my house! I’ve had such a huge response to my post on The Perfect Baked Sweet Potatoes that I thought I’d show you Stage II: how I stuff them full of dee-licious fillings to turn them into a complete meal. 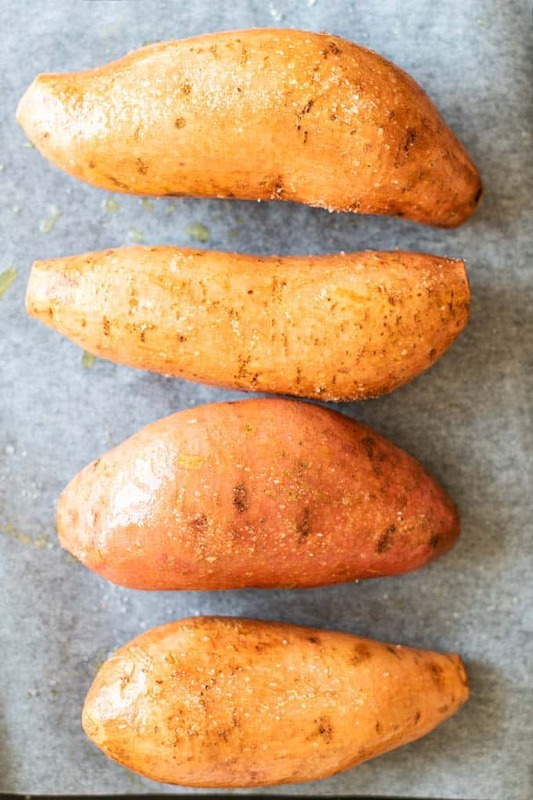 The first step here is to get your sweet potatoes ready! I buy nice, large sweet potatoes, and then give them a light rub of olive oil and salt. This helps crisp up the skin and give it a delicious “potato chip” quality when eaten hot out of the oven — yum! Even if you’re meal prepping these, you can put them back into the oven for about 10 minutes and the skin gets crispy again. If you’re like me, and end up eating them cold 95% of the time (because who has that 10 minutes mid day to heat it back up? ), then the subtly salty flavor still makes the skin that much more appealing (and remember — the skin is packed with fiber, so eat it!). 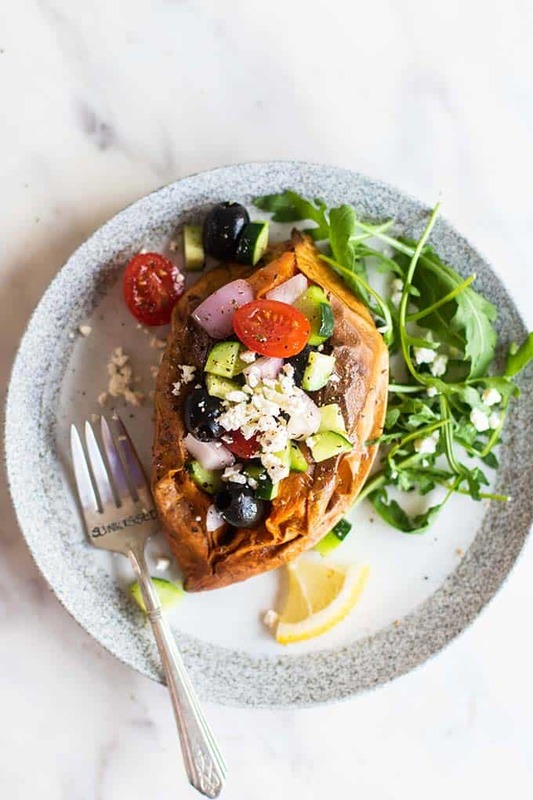 Perhaps the most made stuffed sweet potato in my kitchen is one with a Greek style salad filling. Adding greens to most meals is a must! 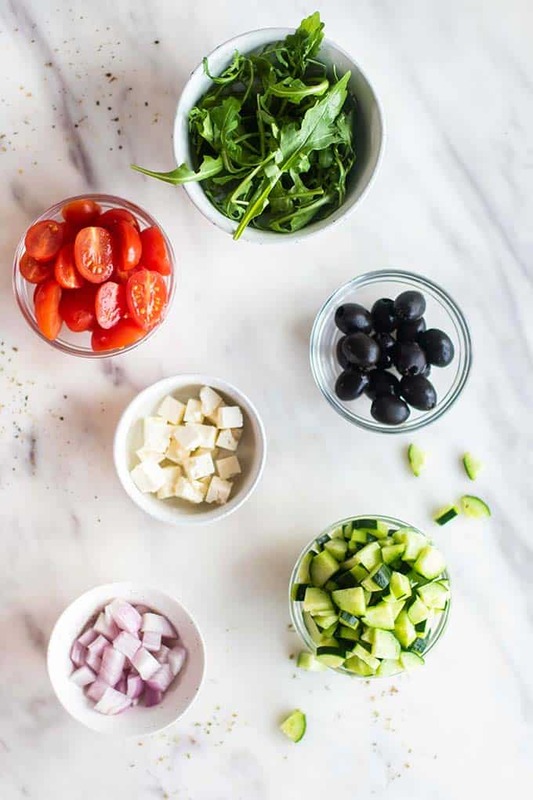 Spinach or arugula is added, and then a combination of cucumbers, tomatoes, olives, and onions. 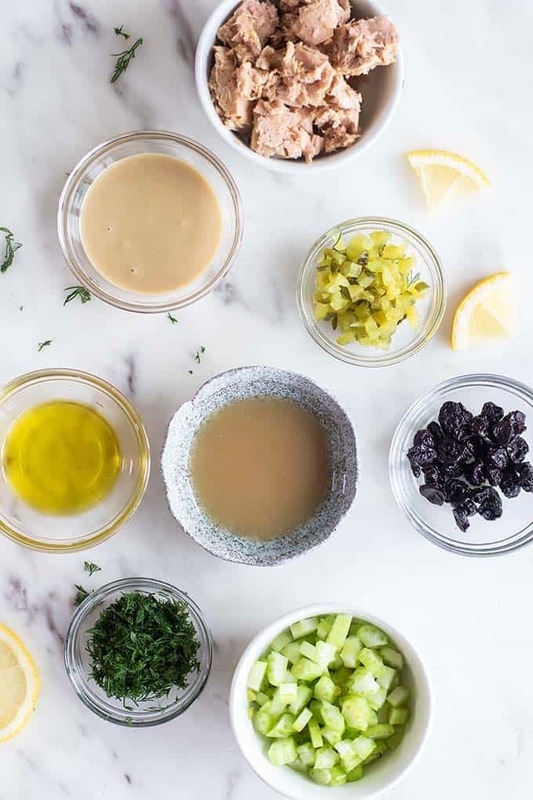 I toss it all in a light vinaigrette (no need to pre-make the dressing — just pour it all on the ingredients and prepare a batch of the filling). If you’re a cheese fan, you’ll want to add the feta. You can keep these vegan & Whole30 by skipping the cheese. You can also sub parmesan if that’s what you have on hand! I often will add leftover chicken or fish to this version, to bump up the protein. Add chickpeas or white beans for a vegetarian addition! I prepare enough filling for 3-4 sweet potatoes, and keep the potatoes stored separately. These would easily make it until lunch time if you wanted to stuff one in the morning and take it to work. I often have a few fillings ready to go in my fridge, so I wait until meal time to decide what mood I am in. A new fav — I just tried this combo so I could include an option higher in protein, and this is possibly my new favorite (I’ve been eating the leftover tuna salad on crunchy romaine leaves!). I am not a mayo fan, so I made a tuna salad with my favorite salad dressing — tahini and lemon juice. A little drizzle of olive oil keeps the tuna from tasting dry. I mixed in crunchy celery and pickles, and some fresh dill, and then creamed it together with tahini, olive oil and lemon juice. SO GOOD! Try this one! I threw in some Fruit Bliss Dried Tart Cherries (highly recommend these little guys! ), and it made a great flavor addition! Make these just like I did, or simplify by using mayo and tuna only. Throw in some greens if that makes it easy for you. 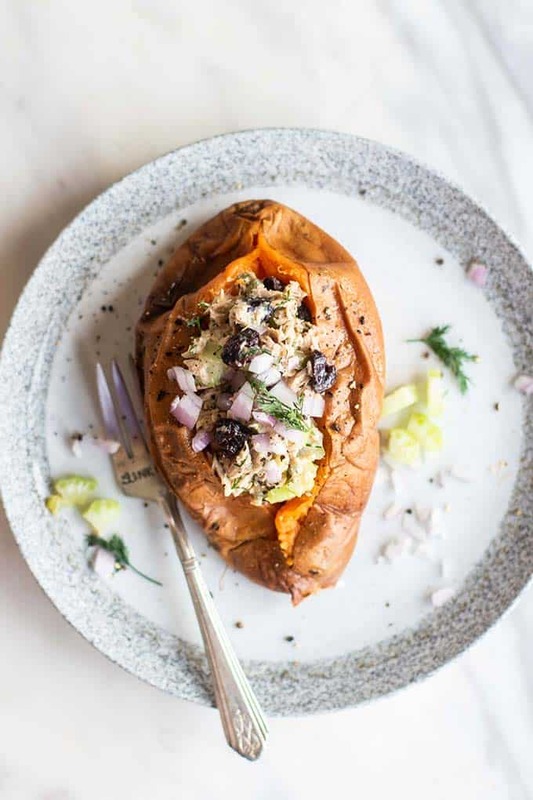 Whatever you end up trying, you’ll love the tuna stuffed sweet potato. A can of tuna plus some veggies makes enough to stuff 3-4 sweet potatoes. Mix up a batch and have lunches ready to go! This filling also goes great with crunchy spears of lettuce or on crackers. Mexican flavors are a go-to around here. 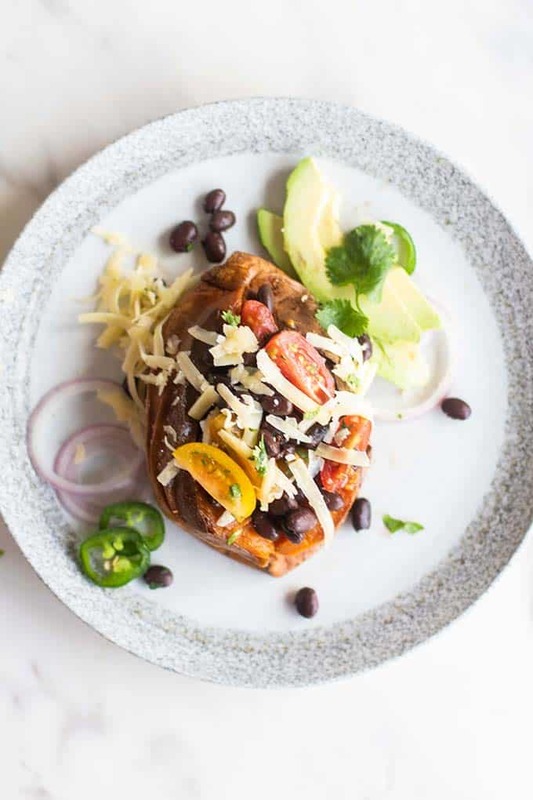 Black beans are perfect for throwing together last minute meals or for vegetarian options. Using black beans adds even more hunger-fighting protein and fiber to sweet potatoes. I mixed black beans with a little lime juice, some cumin, and sea salt (because my black beans were unsalted), and also some chopped jalapenos and tomatoes. 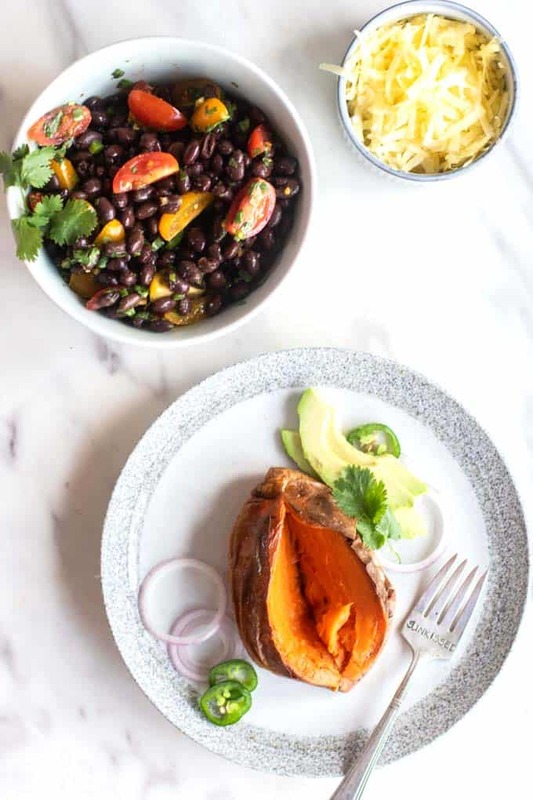 A can of black beans with the additions is enough to stuff 3-4 sweet potatoes. Make the mixture, shred the optional cheese, and have some ripe avocados standing by (not optional). If you need this to be Whole30, used chopped chicken breast instead of the black beans. Lately I have been making a large batch of ground turkey with taco seasoning, and then freezing it in single-serve portions. When I need protein to add to a meal, I pull it out and reheat it. I LOVE having this option. 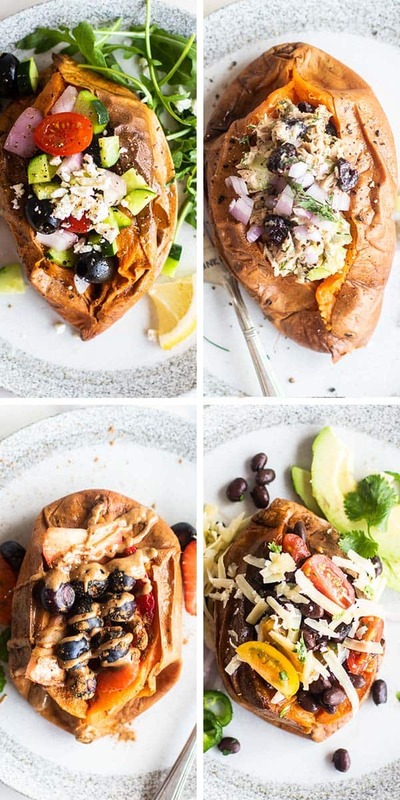 Annnd — the breakfast stuffed sweet potato! Really, you could mix this up with your favorite breakfast fruit. I like berries the best, but I imagine chopped apples or pears would be delicious too, especially if you sprinkled them with walnuts or pecans. If you haven’t tried a sweet stuffed sweet potato, you’re missing you! 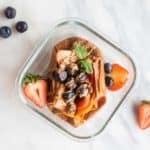 This is a brilliant option for a Whole30 breakfast because they are so easy to prep and have on hand, plus tons of fiber, and a drizzle of almond butter adds healthy fats and protein that help keep you full until lunch. I don’t really “prep” the fruit part. 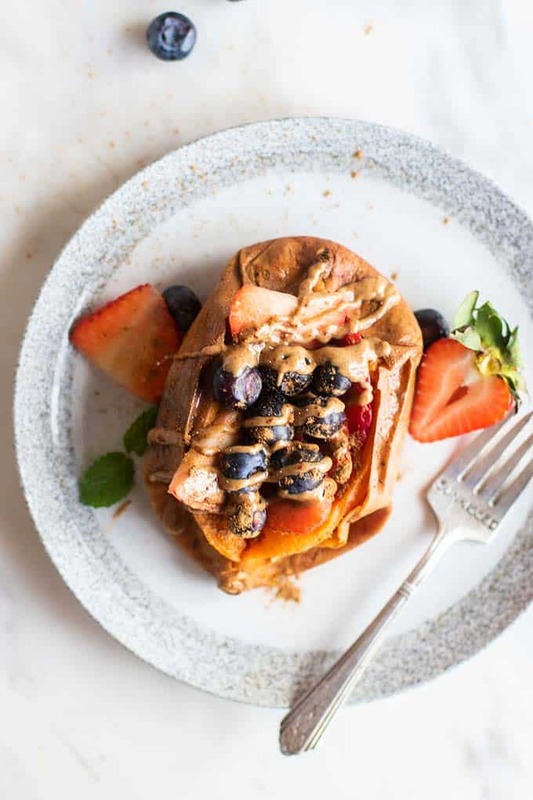 When ready to eat, or ready to pack a meal to take to work, add desired fruit and a drizzle of nut butter. So fast, and so delicious. You can omit the salt if you plan on eating them like this — or leave it! I still like the salt on these guys. Breakfast sweet potatoes are equally customizable. Sub the fruit you have on hand, or even use some dried tart cherries or raisins if that’s what you have. 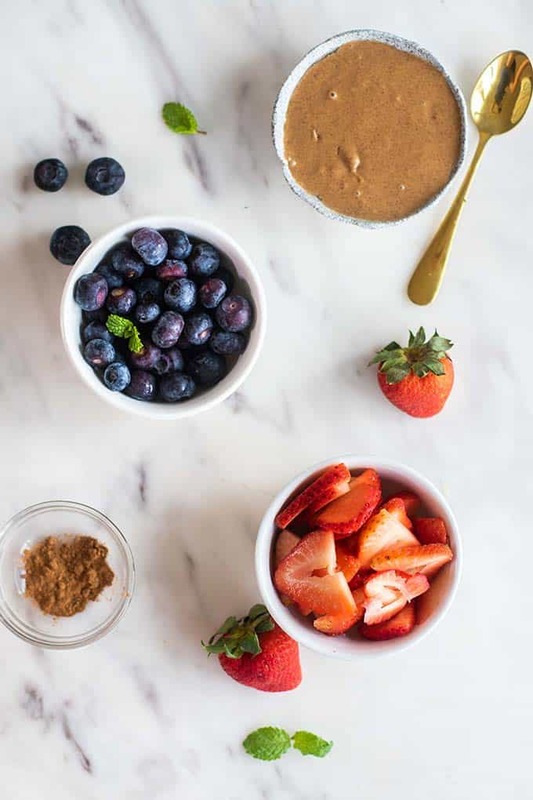 I love almond butter and SunButter, but cashew butter or even peanut would work here too! Add basically anything you would to your oatmeal. I personally don’t love banana in these (the texture of the two is too similar, I think! ), but maybe you will? If you try any of these delicious combos, take a photo and share with me on IG! Be sure to tag @SunkissedKitch – I love seeing what you’re doing in the kitchen also! Have different combos you love with sweet potatoes? Let me know in the comments below! An easy and delicious meal prep idea! 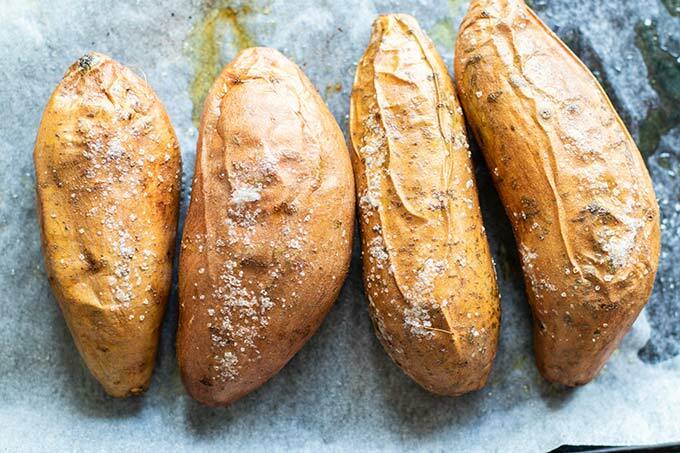 Bake sweet potatoes, and prepare fillings to stuff them with. These 4 filling suggestions are all no-cook- just chop a few veggies and mix together! 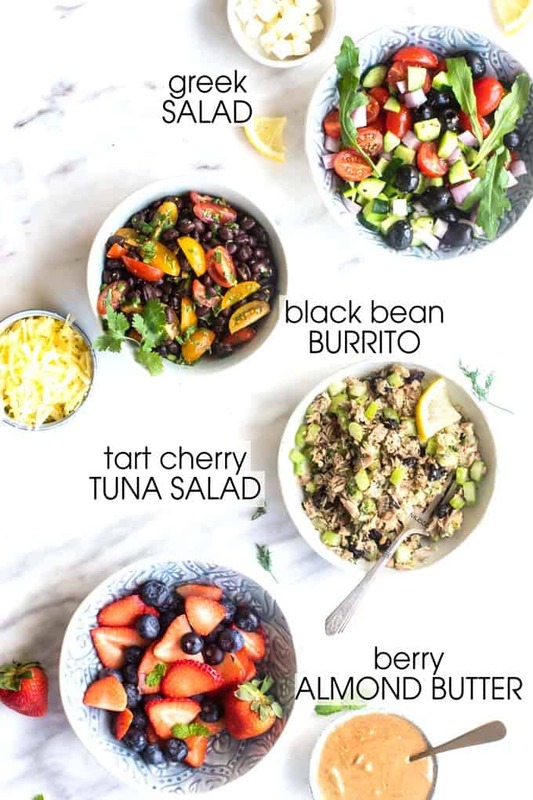 Choose from a Greek Salad, a Black Bean Burrito, a Tart Cherry Tuna Salad, or a sweet Breakfast Berry and Almond Butter option! 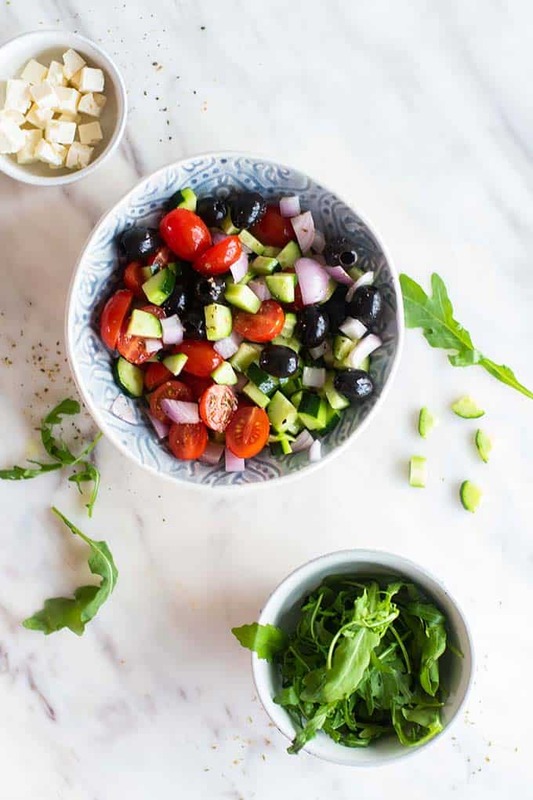 Add chopped veggies along with salad dressing ingredients into a bowl, and mix to combine. When ready to serve, stuff sweet potatoes, and add feta, if desired. 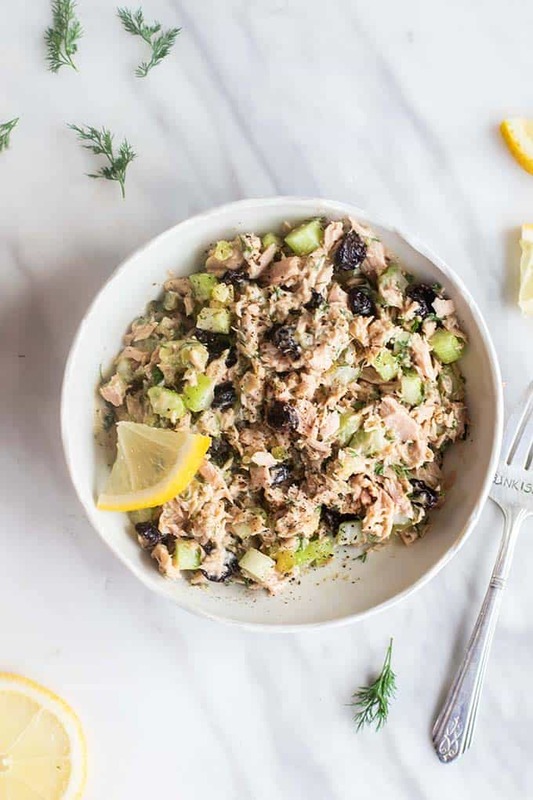 Add tuna, chopped celery and pickles, dill and cherries to a bowl, and then add tahini, lemon juice and olive oil. Mix well to combine. When ready to serve, stuff sweet potatoes with the mixture. 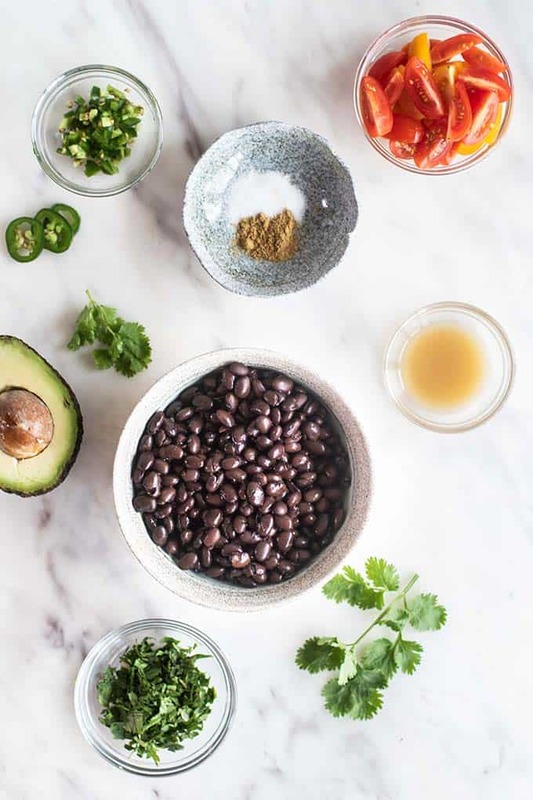 Add black beans, tomatoes, cilantro, and jalapenos to a bowl. Season with lime juice, salt to taste, and cumin. When ready to serve, stuff sweet potatoes with black bean mixture, and top with cheese and avocado. 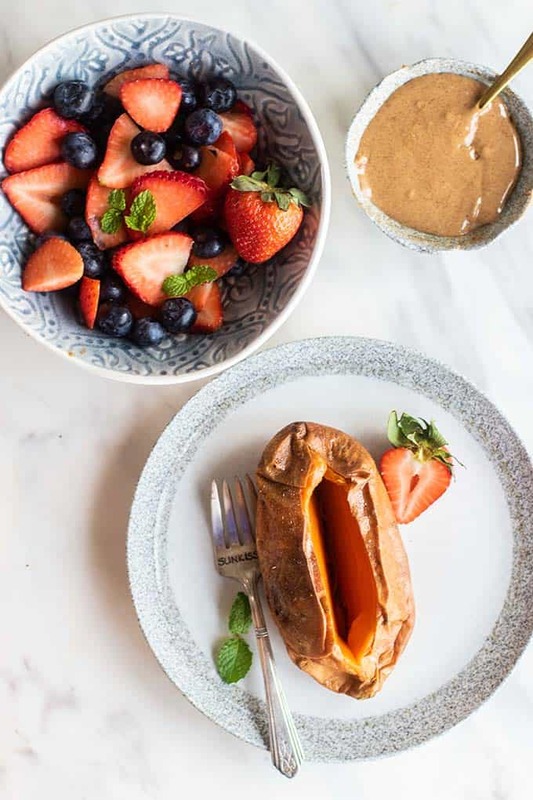 When ready to serve, slice berries, and add berries to a sweet potato. Drizzle with almond butter and sprinkle with cinnamon, if desired. *Nutrition facts are for 1 sweet potato stuffed with greek salad filling. This Stuffed Sweet Potato post may contain affiliate links, meaning if you make a purchase, I will receive part of the sale as a commission. This helps me continue to bring you lots of fresh and inspired recipes!